When the Titans came to Azeroth, one of the first races they created was Mogu — immortal stone beings. They formed landscapes, filled rivers and lakes with water, and were faithful allies of the Titans in their struggle against the Old Gods. The Titans understood that the Old Gods could not be destroyed. Their essence was inextricably linked to all living souls on the planet. Kill them, and Azeroth will fall. Deprived of former power, but not of their bad temper, the Old Gods were forced to languish in dungeons deep inside Kalimdor. To take revenge on the offenders, Yogg-Saron, the God Of Death, the Fiend with a thousand faces, sent a terrible curse on the races of Azeroth, including Mogu. Greed, cruelty, fear, and anger filled once-stony hearts. They became mortal. Although the Titans could not destroy the Curse of the Flesh, their mission on Azeroth was over. They were off to search for new worlds in the endless universe. Mogu, having become mortal, lost the ability to hear their distant voices. And when the memory of the Titans faded completely, Mogu started counting themselves as their successors and rulers of the southern part of Kalimdor. With the help of magic, they learned to catch the souls of the dead and infuse them into stone statues. That was beyond any other race’s power. It was overwhelming. Mogu forgot how to live in harmony not only with other races of Azeroth but also with each other. This is how the Age of a Hundred Kings began. Lei Shen happened to be the one to reunite all Mogu clans under a common banner. Even as the son of one of the many insane generals, he attached great importance to the origin of his race. He believed that Mogu, the first after the great Titans, endowed with the power to resurrect the souls of dead relatives, had to rule on Azeroth. And this could only be achieved by bringing all the clans together into one. Once he went to the heart of Thundering Mountain. There was still the Titans engine, with which they created the first stone Mogu. No one knows how his meeting with the guardian Ra-den passed. We only know that Lei Shen seized the Engine and the power of the guardian. 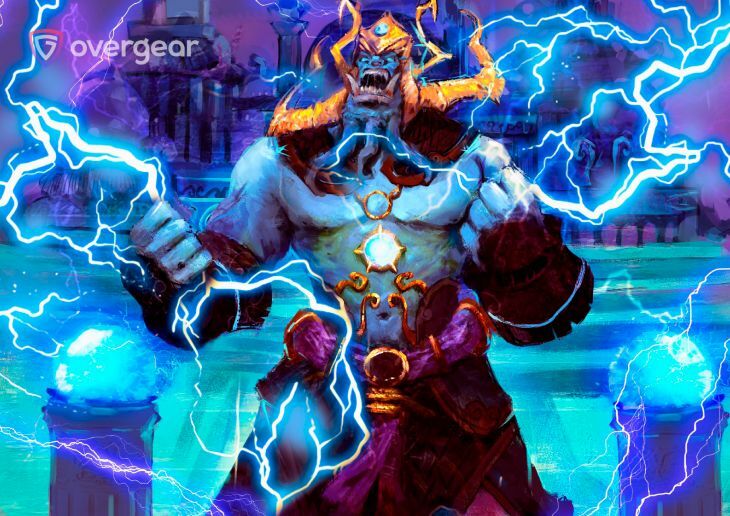 Endowed with great power, he called himself the Thunder King, conquered the lands of other Mogu leaders and forced the other races to submit to his will. It was the heyday of the Mogu empire.